As Honda’s flagship model, the new GL1800 represents over 30 years of evolution on the “Interstate” platform, and it’s come a long way to say the least. One thing that has remained constant is Honda’s dedication to comfort. The fairing and adjustable windshield forms a veritable cockpit that hides the rider from wind and weather, —boots to helmet — and the mirror housings break the wind off your fists. Heated handgrips and seats complete the cold-weather riding ensemble. I actually sneered a little when I typed that last; but truth to tell, there have been times that I would have given my eyeteeth for heated grips, and I am not above taking my seat inside with me at night so at least it’s warm in the morning. 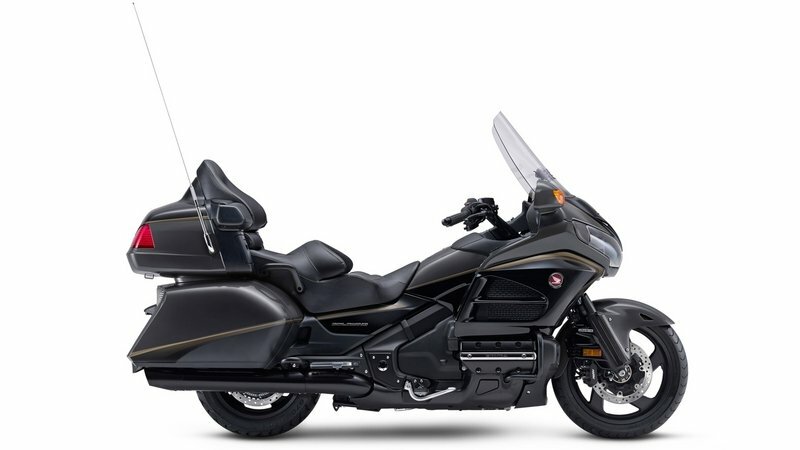 While the Gold Wing comes fully bagged out and singularly set up for long road trips, the F6B and F6B Deluxe loses the trunk and tall windshield for a clean, yet somehow menacing look that I find comparable to the Harley Street Glide and Victory Cross Country, among others. This is a solid move because that market is enjoying something of a boom right now, and Honda already has a proven platform in the GL series. Both the full-dressed version and the F6B bagger version come with a number of sub-models, and two of them really stand out. 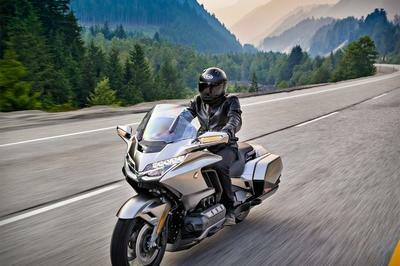 First, the dresser Gold Wing line offers an airbag model in Grey Metallic / Black that comes with collision detection sensors that deploy an — you guessed it — airbag that help reduce ejection speed in the event of a head-on collision. Comforting, to say the least. Secondly, the F6B is available in a standard version, or a Deluxe version that comes with commonly added accessories, namely the centerstand, heated handgrips and passenger backrest, so if you fancy any of those options, you can roll them right off the showroom with the Deluxe package. 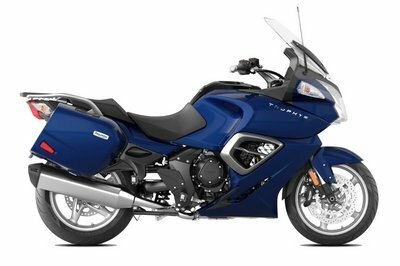 Although it fits the very definition of a big bike, the Gold Wing family maintains a compact wheelbase at only 66.5-inches long. The beauty of the frame layout lies with the trail. 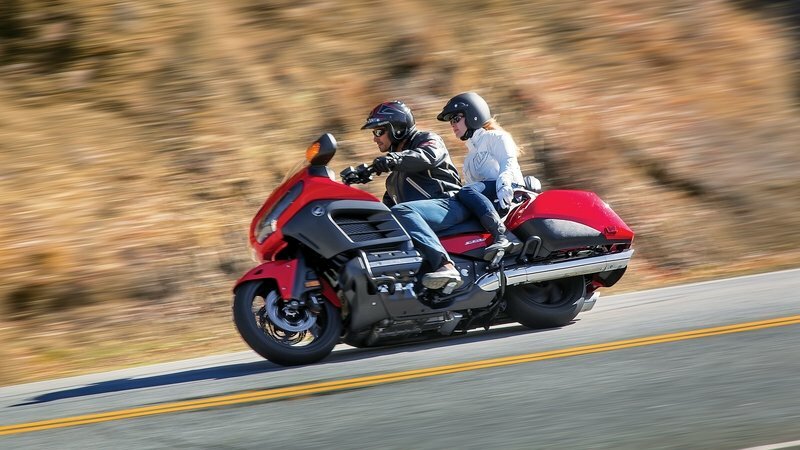 At only 4.3-inches long, the short trail contributes heavily to the Gold Wing’s phenomenal cornering ability, and that agility is one of the cornerstones of the Wing’s success over the years. Of course, the cornering performance gets a lot of help from the low center of gravity created by the fuel tank arrangement and flat-six engine. Brake and suspension components have their work cut out for them. At 900-plus pounds wet, and well over half-a-ton with some combination of rider, passenger and cargo, this is a whole lotta’ bike to keep under control. To that end, Honda started out with 45 mm, right-side-up, cartridge forks that come with an anti-dive feature to combat that tendency under heavy braking. The rear suspension runs with a monoshock on a single-side swingwarm, and it comes with a computer-controlled preload function, so no dirty knees are required for a quick adjustment in response to a load change. With 4.8 inches of travel up front and 4.1 inches in the rear, the GL family comes with a pretty plush ride. The front brakes run big, 296 mm disc brakes with three-pot calipers, and the rear runs an even bigger 316 mm disc, also with a three-pot binder. While it’s a little unusual to see a bigger disc in back, I reckon this is for the folks who like to tour with a little trailer, and I know from experience that it doesn’t hurt to have a little extra insurance back there, especially if your trailer doesn’t have brakes. Honda uses its combined brake system (CBS), a brake-by-wire feature that reads rider input and distributes braking pressure in the correct proportions to the front and rear brakes while preventing wheel slip from overbraking — all good stuff for hitting the highway with confidence under a full load. 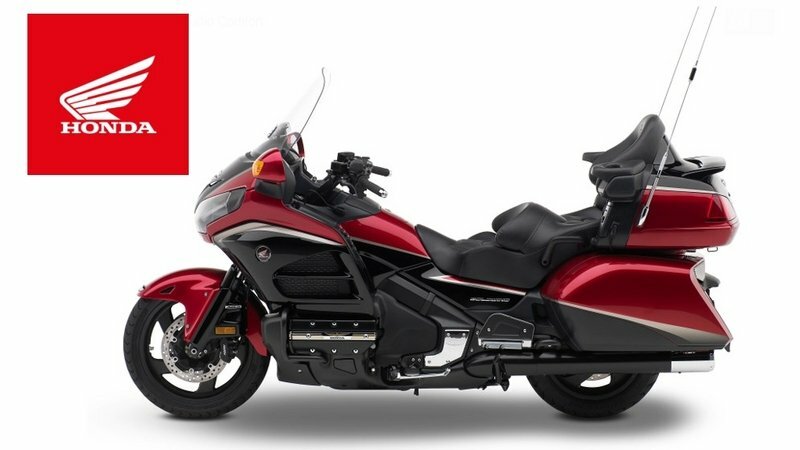 Honda used its liquid-cooled, 1,832 cc horizontal six as the beating heart for all Gold Wing models this year. This slightly over-square mill runs with a 74 mm bore and 71 mm stroke, SOHC and dual-valve heads. A Programmed Fuel Injection (PGM-FI) feature and digitally mapped ignition control manages the power output and helps the mill meet emission standards. While the engine is the same across the board, the rest of the drivetrain isn’t necessarily so uniform. The GL1800 comes with a feature that doesn’t make it onto the F6B / Deluxe, namely an electric-reverse function. I’ve already established that this is a lot of bike to control, and saving yourself the effort of having to Fred-Flintstone it to back up is huge, especially with a trailer in tow. This five-speed, overdrive-ratio transmission, and shaft final drive, delivers quiet power to the rear wheel for comfortable highway cruising. 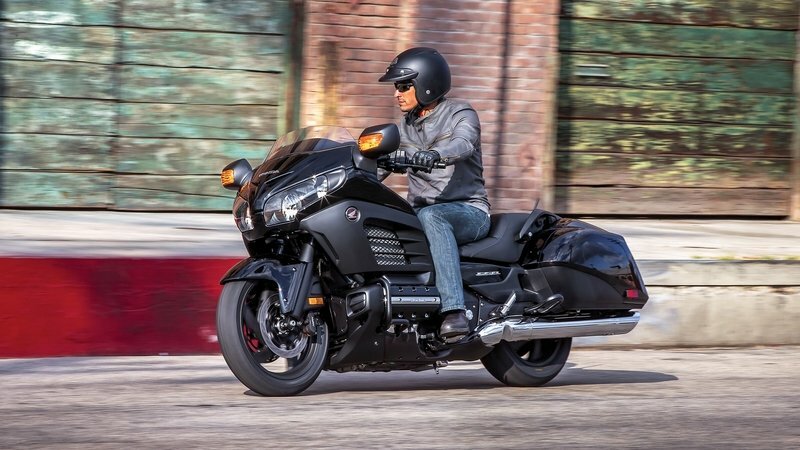 The factory calls the baseline GL1800 package the “Gold Wing Audio Comfort,” and in spite of the champagne nature of even the base model, Honda lets go of it for beer money at only $23,999. 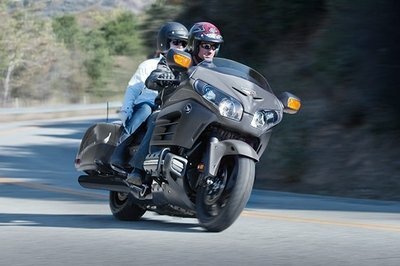 The top-of-the-line “Gold Wing Airbag” with all the bells and whistles rolls for around 7k more, still not as high as some big-name competitors I can think of. Stripped-down looks equal stripped-down prices for the F6B sub-family. The GL1800B “F6B” barely breaks the 20k mark at $20,499, and the GL1800BD “Deluxe” model will set you back another grand at $21,499. Not exactly entry-level range, but definitely within the realm of reason for most. 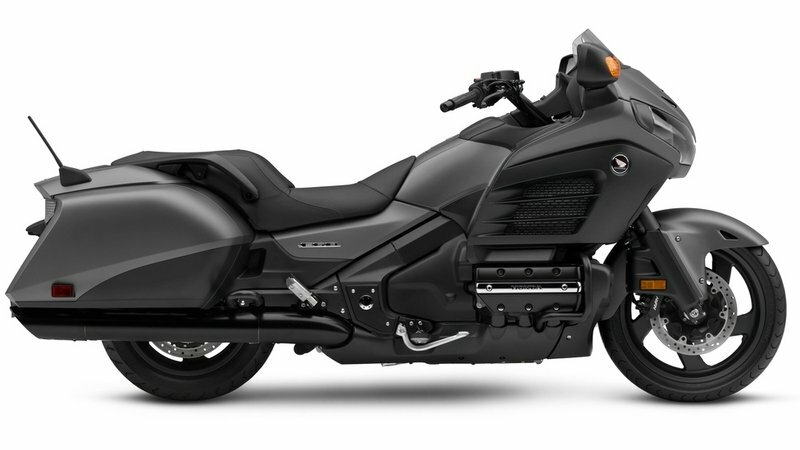 By Honda’s own admission, the Gold Wing was designed to compete with the domestic tour bikes on U.S. shores. So, I thought I would pick another typical American dresser that also comes in a pure-tour configuration as well as a bruiser layout, and the Cross Country and Cross Country Tour (CC / CCT) from Victory seems a good choice for a non-Harley competitor. 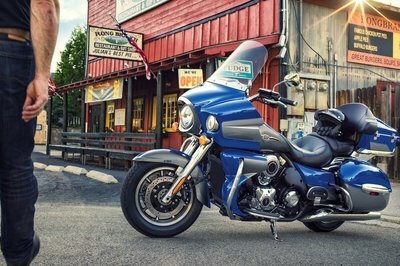 Victory follows a more traditional look with a fork-mounted fairing and open engine compartment, but the tradeoff comes at the expense of comfort, and the CCT lacks the cockpit-like bubble of the Gold Wing. 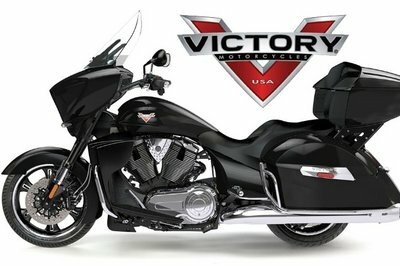 To be fair, Victory does offer many of the same features as Honda, such as ABS, cruise control and an accessory sound system, just with a different delivery, as it were. In spite of the extra body components, the CC manages to maintain just a bit of the typical Victory swoop, but not too much in my opinion, just enough to let you know what you are looking at. As always, looks are subjective, and even secondary to performance for some, hard to believe, I know, but there it is. Another aesthetic feature with nothing directly to do with aesthetics would be the engine. Victory runs its Freedom 106/6 engine in the CC family, a big V-twin mill that fits right in with American bike culture, and so the engine itself becomes part of the overall look. Honda shrouds the GL mill, so in that case the lack of engine visibility adds to the look. 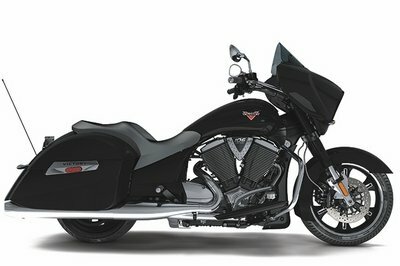 I guess I should mention that the Freedom has that nice, V-twin lope that is so musical to American ears. The CC family scores a minor victory, if you will forgive the pun, in the price category. While the full-tour model will set you back $21,999, two grand less than the base GL1800, the CC in the bruiser configuration sans tour pack sneaks in just under 20k at $18,999. Also, the Gold Wing comes standard with electric reverse. If you want to back up without foot power on the Cross Country or Cross Country Tour, you’ll need to add a $2,000 reverse kit accessory. At the end of the day, both rides are capable tour bikes, you just have to ask yourself which look appeals to you. My wife and fellow writer, Allyn Hinton, says, "I remember when (don’t you hate it when elders start sentences with ’I remember when…?’) the Gold Wing was just a beefy cruiser — no bags, no frills, just a typical UJM — Universal Japanese Motorcycle — that was popular in the 1960s and 1970s. They called it a tour bike, but their idea of a tour bike was a lot different from what Americans called a tour bike. Let’s face it, how long and far are you going to ride in Japan before you start doing laps? When the Japanese designers came here to get a feel for what Americans call a tour bike, they realized that we have a lot of distance to cover even going in a straight line. In 1980 when the Gold Wing Interstate was introduced, touring folks went nuts. Here was a UJM with all the benefits of that but with the typical touring features added — the full fairing, bags and top case and a comfortable saddle. And yes, the Japanese designers took what they perceived as our preoccupation with horses (the horse had won the West, yeah?) and shaped the seats of the early Gold Wings like saddles. 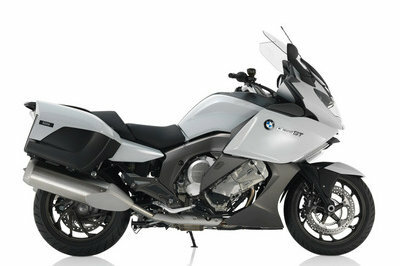 Touring folks rejoiced and even today, the Gold Wing has a loyal following."